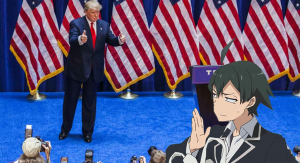 These are the top anime some of the world’s most charismatic political leaders think you should watch if you want a career in country-leading. “The country’s politics, like high school, is a game of attack and defense,” Obama said. “It’s a win or lose, do or die situation in a world of antagonism.” He also cautioned against “nice girls,” who are guaranteed to catalyze an existentialist crisis and later absolute ruin of any man’s soul. Presidential candidate Hillary Clinton issued a public statement criticizing Obama’s desire for anything genuine, which only seemed to incite him further. Outside sources stated that Obama was a man of “severe insecurity and self image issues” and advised against taking any of his words about the United States’ doom too seriously. Chinese President Xi JinPing praised main character Light Yagami’s efforts for removing “unwanted” peoples from society and maneuvering the media with the country’s best interests in mind. 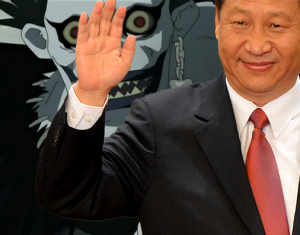 Xi explained that he had already been implementing the critical lessons he learned from Death Note by cracking down on corruption and media. He cited the prohibition of distribution of titles such as Attack on Titan, Psycho-Pass, and Death Note as his most drastic course of action in order to maintain his country as well as Yagami did. Unfortunately, he lamented, leaders these days cannot rely on supernatural notebooks, so they have have to come up with other tools to preserve the peace. Xi also noted that learning from Yagami’s mistakes was instrumental in his success as a political leader. With Crimea integrated into Russia, Russian President Vladimir Putin confidently thought to himself that his empire was following in the honorable track of Britannia, acquiring significant land, wealth, and manpower. Russian backed separatist rebels were swiftly indoctrinated as honorary Russians while Ukrainians lost many of their independent rights. “All men are NOT created equal!” Putin exclaimed with a passion never seen before. “…that is why people discriminate against one another, which is why there is struggle, competition and the unfaltering march of progress. Inequality is not wrong, equality is.” Putin proceeded to monologue Russia’s almighty superiority with the confidence, noting to himself to get rid of anyone who blamed him for copyright. Putin also highlighted the importance of having few children, not disowning them, or alternatively, getting rid of any problem children altogether. With the successful hydrogen bomb test that Anime Maru reporters were able to get insider information about due to a close affiliation with North Korea’s best journalism schools, North Korea’s Leader Kim Jong Un is spending greater energy bolstering his nation’s military industrial complex. Kim stated with complacence that North Korea’s military technology is already far superior to that of other nations, and he is just waiting for a gateway to launch a surprise attack and proceed to dominate the whole world. When asked about the chance of eliminating an entire nation’s population before forming a foreign harem, Kim quickly dismissed the idea with “Americans are too ugly for someone like me” and fondly patted his Rory Mercury body pillow.